Just a few short years ago, building static websites by hand with HTML/CSS was the norm. Nowadays, WordPress powers almost 14% of all websites. Originally developed as a blogging platform, WordPress has since morphed into a powerful content management system for all types of websites. But, as with most things that evolve from what they were originally meant to do, there’s some fine-tuning that will be required to make them as functional as possible. While WordPress has top-notch SEO features out of the box, there a handful of things you can enhance to achieve even better SEO. The following are some basic tips on how to fine-tune your WordPress site to attain improved search engine results ranking. You can find the permalink settings under Setting > Permalinks. 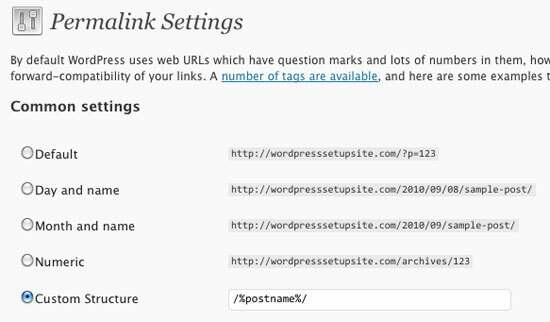 The permalinks feature allows you to create custom URL structures for your WordPress content. From an SEO perspective, this is not ideal because you aren’t getting any benefit from having keywords in the URL, a known ranking factor for search engine results. Some SEO professionals believe that the most effective structure is to have a single-level URL structure for your blog posts. For example, the first URL structure below is better than the second URL structure after it. 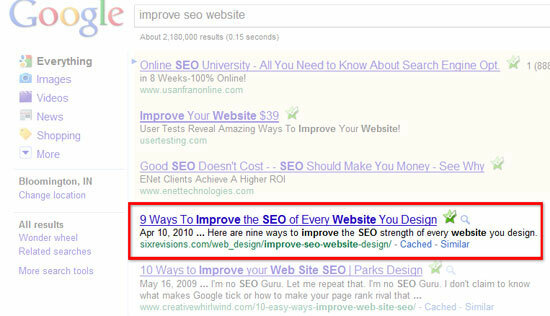 The <title> tag of your web pages is an important factor in SEO; all web pages should have a unique <title> tag. By default, however, the <title> for your blog posts in WordPress is “Blog name » Post title,” and search engine users probably wouldn’t find that very compelling to click on. For your WordPress site to get the most benefit out of its <title> tags, it should be altered by fronting-load keywords so that it can match with search terms that people use. 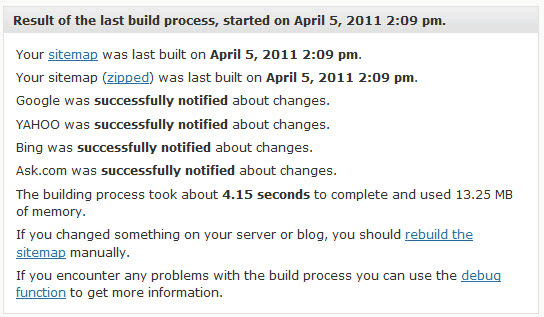 This means having the post title come before the blog’s name. To change your <title> tags, I recommend installing the All in One SEO Pack plugin. This WordPress plugin will automatically set up your <title> tags, making them more SEO-friendly. You also have the ability to manually specify the title of each post. The All in One SEO Pack WordPress plugin is one out of the six WordPress plugins that this site uses. Meta description tags provide short explanations of what a web page is about. In search engine results pages, these descriptions appear as excerpts of the web page. It’s ideal to incorporate keywords you would like to rank on in your meta description tags. However, do so in a human-friendly, non-spammy way. The description should optimally be between 150-160 characters, the limit of many search engines before the description is trimmed at the end. In WordPress, there’s no ideal way to automate the process of creating meta description tags. The best descriptions should be handwritten, and the previously mentioned All in One SEO pack will allow you to configure them for each post. You can also add meta keyword tags on your posts for relevant keywords and key phrases, but it should be mentioned that Google no longer takes meta keyword tags into account when determining search engine rankings. With that being said, they won’t hurt, and there are other search engines out there besides Google that might use meta keyword tags as a signal for ranking, so I still recommended adding keywords as a best practice. You can also add meta keyword tags in your blog posts via the SEO All in One Pack. By default, WordPress has a few different ways to navigate to your content pages. Depending on the WordPress theme you’re using, you might end up with duplicate content, which is bad for SEO. Not good. So how do you fix this? By using the noindex HTML meta tag, you can inform search engines not to index certain URLs, which then reduces the chances of your site being penalized in search engine rankings for duplicate content. The easiest way to do this is by using the All in One SEO pack plugin. In the plugin, you have the option to assign noindex for category, archive, and tag URLs. Using HTML heading tags (i.e. <h1>, <h2>, …, <h6>) to break up sections of lengthy blog posts and other content pages is a good way to make your content easier to read. It’s also regarded as a way to point out important keywords for web spiders as they may value these tags higher than other HTML text tags (such as <p> or <blockquote>). What’s somewhat surprising is that, to this day, many WordPress themes still don’t pay particular attention to the content structure of a WordPress site’s content pages. From an SEO perspective, <h1> is the most essential heading and should only be used once on a web page. The <h2> tags are next in the hierarchy, and you can have several of them on the page. Below each <h2> you can have several <h3> tags, and below each <h3> tag, you can have several <h4> tags, and so on. This is a semantic way of structuring your content, kind of like a book outline. If you’re using a WordPress theme that you didn’t build yourself, look into the theme’s template files (such as header.php,single.php,post.php,home.php, and page.php) to ensure that built-in HTML markup follows good content structuring. If you did build the theme, double-check to make sure that you’re using good content structures. An XML sitemap is a standard protocol used to create an index of a website’s pages to help search engines find pages to crawl and to give them a better understanding of the website’s structure. XML sitemaps are easy to create manually, but if you update your site with new content often, it might not be a good idea because you’ll have to constantly update your XML sitemap. Using the Google XML Sitemaps WordPress plugin will automatically generate an XML sitemap of your WordPress website for you. It will even notify Google, Yahoo, Bing, and other search engines that your XML sitemap has been updated. What are your own WordPress tips and tricks for SEO?